Pesticides were designed to kill those pests that affect the production of crops, fruits and vegetables. But just like antibiotics which kill a wide variety of bacteria irrespective of either that bacteria is good or bad for humans, pesticides target something more than just harmful pests. Some studies found that pesticides affect the count of bees, which are necessary for pollination. 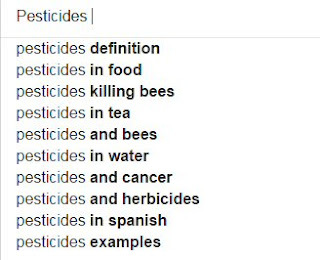 Some pesticides are feared to cause cancer in humans. In United States during year 1996 FQPA (Food Quality Protection Act) directed EPA (Environmental Protection Agency) to completely reassess pesticide residues on food, keeping the safety of children in mind. From 1996 to 2006 EPA has cancelled or restricted the use of 270 pesticides to keep the children and adults of United States safe. What is permissible pesticide residue level ? Permissible pesticide residue level is that level of pesticide residue on a food which can be considered safe for eating. Once the pesticide is sprayed on a food item/plant in fields, the pesticide stays in certain amount either inside that food or on its outer surface. After some time ranging from days to weeks spent by that food item under the sun and then washed before getting into the retail stores, the pesticide level is decreased to a great extent. At that time the amount of pesticide measured on that food is known as pesticide residue level. If it falls under the permissible limit then its considered safe to eat. Almost half of all vegetables produced contain traces of pesticides. According to some critics even the permissible amount of pesticide residue is harmful, especially when we get them as a cocktail from different products. However governments take step to keep people safe from dangerous chemicals used in the agriculture and production sector, but the truth is that still people fall prey to negative effects of such chemicals. Pesticides are one of such chemicals. You may find yourself safe by reading the guidelines of EPA about the pesticides usage, but EPA can't control whole world. Those of you who visit foreign countries where there is no such guidelines, what about those countries. Those harmful chemicals which can't be sold in USA, can be easily sold in other parts of globe. Some advocates of pesticides claim that Pesticides help in increased production and also beautify the look of fruits and vegetables, which helps in keeping the prices down. It may be good for economy but not for the health of consumers. Today world needs pesticide free farming to provide a disease free life to next generations. We should bring organic methods of farming into trend and do some research in that field in spite of developing new pesticides every year and making bugs more resistant.